Ever wonder how a fan club becomes official, or why anyone would ever form one? The former president of the official CHINA BEACH fan club and current president of an international Xena fan club, Anita Louis Silva talks about the ins and outs of the fan club life. The sign read: "You are now entering the finest facility in Vietnam, the Five and Dime." I walked into the hospital and stood by the beds, plasma bottles hanging by them. I could feel the aura penetrate the set. Scenes from the TV show, CHINA BEACH, played in my head. I could see McMurphy and Dr. Richard bent over a table, working to save Dodger among so many others in pain, even though I stood alone on a silent set. I looked over and could see I was standing by the Kansas flag that was McMurphy's in the series. I was also standing next to the sign that read: "Through these portals pass the most important people in Vietnam, our patients." It had been quite journey that had taken me from anonymous fan to the set of CHINA BEACH. My involvement with CHINA BEACH started as nothing more than an interest. I watched the pilot aired on April 20, l988, and it felt like the show reached out across the miles, into my home and into my life. I was hooked. One day a friend asked, "Did you see it?" I answered and a conversation started. The next thing I knew I was holding a meeting with people who shared my interest in the show. Over time the group grew. One day I realized that I should contact the studio and let them know our group existed. But when I called, the studio representative told me that I needed to have my attorney contact them and then they would set up a meeting with us. I shrugged and wondered if it was worth it, but I did contact my attorney and request that he contact the studio. I then called and an appointment was set up. Because I was traveling to Los Angeles from my home in Albuquerque, NM, plane and hotel reservations had to be made. That meeting was only the first of several meetings that eventually lead to the creation of The Official National China Beach Fan Club later to become the International Fan Club for China Beach. As president, I eventually made many trips to California, first meeting with the studio representative and later meeting with many people who worked on the show. This gave me and the club a link to the show, and allowed me to pass information to the studio. The studio could keep me informed of what was happening, and I could then keep the fan club members updated on the series. Eventually, our club had an excellent working relationship with the show. 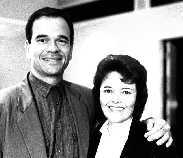 From that day I first flew to California in 1989 until the show went off the air in 1991, we were fortunate to have close contact with the show. Our China Beach Club began before the Internet became popular. We kept in touch through meetings and newsletters and found, like the internet clubs of today, that we played many roles. First, we offered CHINA BEACH fans a place to belong that was officially recognized by the studio. Together our club became a type of family where we all worked for the same goals of promoting this wonderful series and its stars. We provided opportunities for communication between people with common interests. As a non-Internet club, we communicated by telephone, writing letters, sending faxes and through the club newsletter. We were able to gather information about the stars and show and disseminate it to the fans. When fans were unable to get answers to their questions from the studio, the fan club could provide the information or provided the name of someone who would have the information. Our club also helped fans to feel important. Sometimes when fans tried to talk to representatives of a studio, including a show's publicist, fans felt as if they were not taken seriously. The fan club treated all the fans as important. The club also offered us an opportunity to work together toward the common good. For example, we were able to hold raffles to make money for charity. Some fan club members also shopped for senior citizens, took them to the store, raked their yards and trimmed their hedges. We kept the news media informed about our activities and helped provide visibility for the show. When we contacted the media, they were happy to hear about the club and its upcoming events. Once, a TV station sent out a mobile unit to interview me and attend one of our meetings. Finally, through conventions, formal dinners, auctions where a star appeared as the auctioneer, and "meet and greet" nights, the club gave us a chance to interact with the stars. 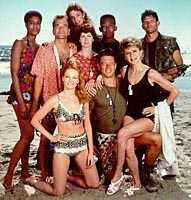 Even though CHINA BEACH was cancelled in 1991, For a short time Lifetime television aired the episodes. We did not disband the club. However, in 1996 many of our members became hooked on a new show, XENA: WARRIOR PRINCESS, and a new star, Lucy Lawless. Quickly we decided to change our focus. That year we officially changed our name to The International Fan Club for Xena Warrior Princess. In just a few years, I had traveled quite a journey. Today, I no longer visit a set depicting an Evac Hospital in Vietnam. Today I travel much farther away, even if I only do it in my mind. As I looked down I could see that my feet were now planted firmly on the ground. I looked around and could see trees. From a distance, I heard an unusual sound, some sort of battle cry. As I listened, the hair on the back of my neck began to stand up and I realized that somehow I had been transported back in time to Ancient Greece. I had heard of the Warrior Princess and her friend Gabrielle. Now I knew I had the opportunity to find out if they were real or not. As I began to walk toward the sound a village woman sauntered toward me. I asked, "I wonder have you seen....?" "Oh yes," she answered. "They are just over the rise, you can't miss them. They are traveling with a beautiful golden horse named, Argo." I thanked her and as I walked away she shouted at me. "Oh, you will probably run into my boyfriend Howar down the road. He'll tell you about the Warrior Princess." As I traveled down the road, I met many people who had stories about the tall woman who wore black leather and was traveling with her faithful friend. I heard how the two had done so much by saving villages and many lives. 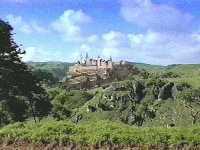 From the magnificent stories I heard, I realized the Warrior Princess and Gabrielle had not been idle. These people seemed to admire them greatly. I knew at that moment, even Ancient Greece had fan clubs. From China Beach in 1989 to Xena Warrior princess in 1996 -- what a fantastic trip!!!! To find more information about fan clubs throughout the world, check out the Fan Club Directory. Fan Clubs are formed for many different reasons. Many are not connected with the Internet. Others are mostly Internet oriented. Many fan clubs are not even organized until after the death of a star. As long as there is one fan who remembers, cares and talks about his or her favorite stars, there will always be another fan who remembers and another. The star will live on.